In Davos is a general Night parking ban. It is valid from 1 December – 30 April in each case from 3.00 am – 7.00 am. Note: Ticket machine only accepts Swiss francs. Coins: CHF 1.00, CHF 2.00, CHF 5.00 and notes: CHF 10.00, CHF 20.00. The Ticket is only valid for the Congress Centre parking area and has to be put behind the front shield. Note: Ticket machine only accepts coins in Swiss francs and Euro. 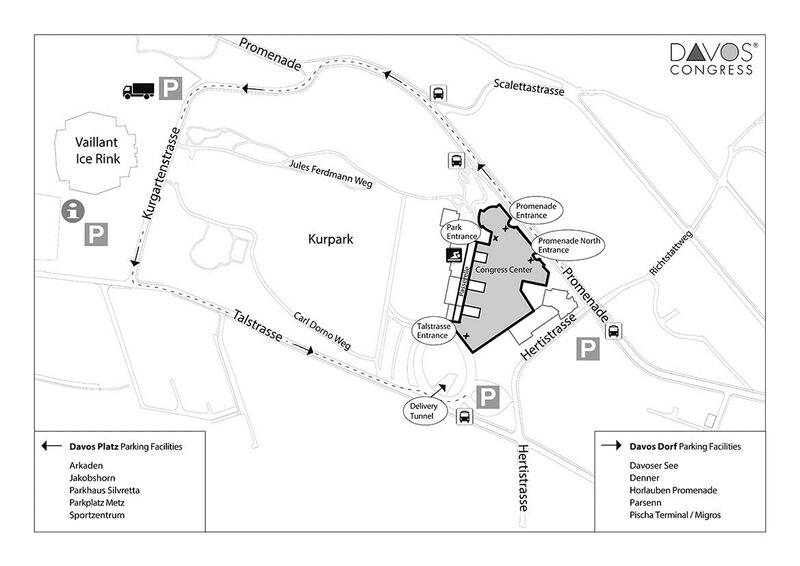 Note: The weekly card is valid for all public parking areas in Davos as long as they permit the maximum parking time. The only parking area for lorries is at parking Panorama (see symbol for lorries). Approx. 5 minutes on foot from/to Davos Congress. Note: Ticket machine only accepts coins in Swiss francs. Note: The weekly card is transferrable.